After the death of its brilliant founder Bruce Wood last year, the question was what would happen to his Dance Project? This weekend provides an answer. In May last year, the Dallas dance world lost Bruce Wood, one of its foundational members. The topic of conversation many people tried to avoid, but couldn’t, was whether or not the Bruce Wood Dance Project would survive. How would they go on without their inspiration, their father figure, their friend? Two weeks after his death, they persevered through their June 2014 shows at the City Performance Hall, performing as if Wood was carrying them through the show, lifting them higher into the air, making them stronger than they had been before. While the performance was acclaimed, the question still loomed: Who would take over the Bruce Wood Dance Project? The question was quickly answered when longtime dancer Kimi Nikaidoh was appointed as Acting Artistic Director. She immediately went to work and continued the training of the company Wood had hand-selected. The company moved forward with the current season’s plans and started to formulate the future. That’s where we find the BWDP now, in the future, and forging ahead with its fifth year. Nikaidoh has crafted a program for their show this weekend that features two Dallas premieres from Wood’s renowned repertoire and one world premiere by Albert Drake, BWDP founding dancer and emerging choreographer. The latter was one of Wood’s wishes—to cultivate new works by new choreographers—and it will be interesting to see what Drake, a brand-new choreographer, comes up with for a company that he knows intimately. The show will open with Requiem, Wood’s unconventional interpretation of Mozart’s unfinished Requiem. It originally debuted in 2003 at Fort Worth’s Bass Performance Hall, and was only performed once. The work is extremely athletic, full of sharp and angular movements. It’s a departure from Wood’s notably lyrical and contemporary balletic quality of movement, but it accurately represents the diversity within his previous troupe, the Bruce Wood Dance Company, and hopefully, what will also be the variety in the new iteration. Following Requiem will be the world premiere of Drake’s Whispers. Drake has been featured in at least nineteen of Wood’s dances. 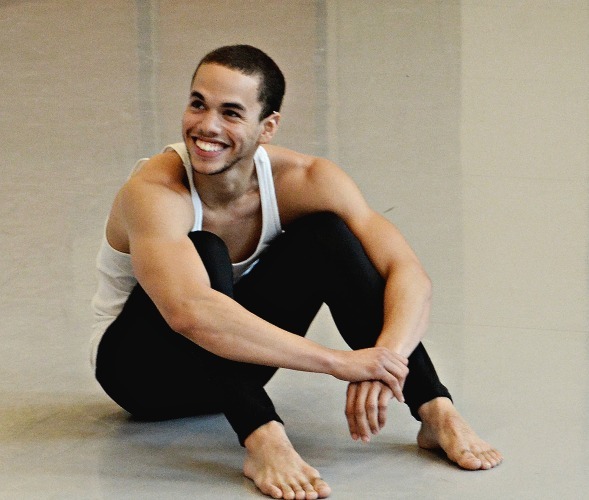 He’s a freelance artist and choreographer, working at Park Cities Dance and Southern Methodist University, where he received his BFA in Dance Performance. Whispers follows eight dancers, including Drake and Nikaidoh, as they explore the varying relationships we can find ourselves in — from support to trust to love. It’s set to a mash-up of music from J. Cole, Max Richter, Steven Reich and Peter Broderick — a combination that is unique yet not unexpected from BWDP. Wood always made interesting choices with music, and Drake seems to be following in his mentor’s footsteps. The same can be said with his conceptual and movement choices, as the work is emotionally charged and highly kinetic. BWDP will close with Polyester Dreams, Wood’s tribute to the music and culture of the ’70s. It debuted in 2002 at Bass Performance Hall, and was the final installment of Wood’s trilogy, Culture Shock. Polyester Dreams is set to the music of Gladys Knight, Jackson 5, Marvin Gaye, among other pop stars. Be prepared to take a journey back in time, complete with big egos, shiny fabrics, and platform shoes, and the social issues that are still as prevalent today as they were forty years ago: racism, gay rights and feminism. There are two chances to see this program this weekend, on June 19 and June 20 at the Dallas City Performance Hall, and they already have their fall performance on the books (November 13-15, 2015). With this first full production under a new artistic director, all eyes on turned to BWDP to see what their future will be. Bruce Wood Dance Project presents 5Years at the Dallas City Performance Hall, June 19 and 20 at 8p.m.